Chile has to be one of the most interesting looking countries. A sliver of land that stretches along the Pacific coastline for more than 6,000 kilometers. Bordered by the cool Pacific Ocean on the west side, and the imposing Andes Mountains on the east, Chile is an isolated place. From central Chile, heading south, the country starts to look like a bunch of puzzle pieces that haven’t yet been put together. 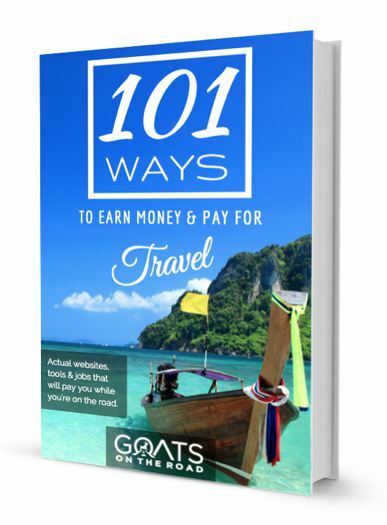 Dotted with islands, fjords, channels and peninsulas – getting around here isn’t an easy feat. 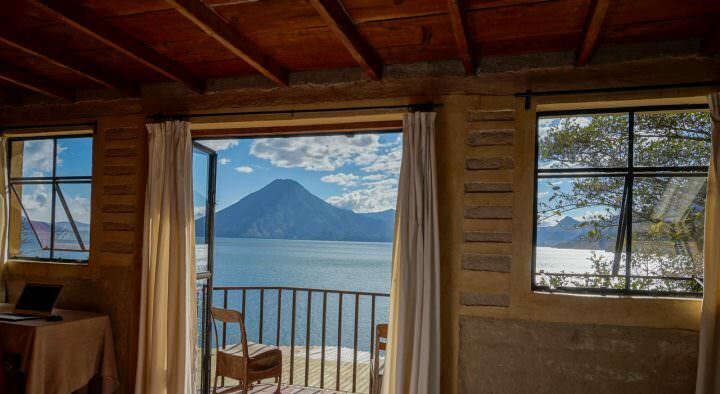 We both imagined what it would be like to live in this part of the world, a windswept frontier sandwiched between mountain and ocean with the dry Atacama Desert to the north and breathtaking Patagonia to the south. 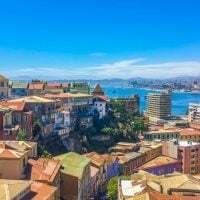 We departed the bohemian, ramshackle city of Valparaíso to the southern most reaches of Chile. It was time to see what Patagonia had to offer. 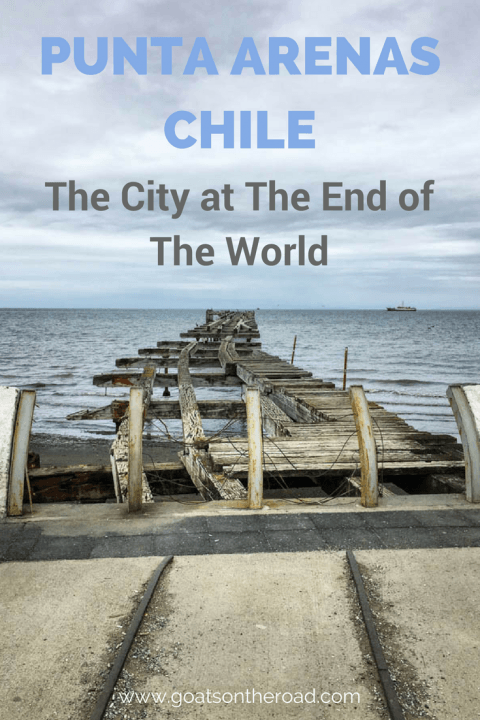 Immediately, we knew we were in another region of Chile, and another world altogether. 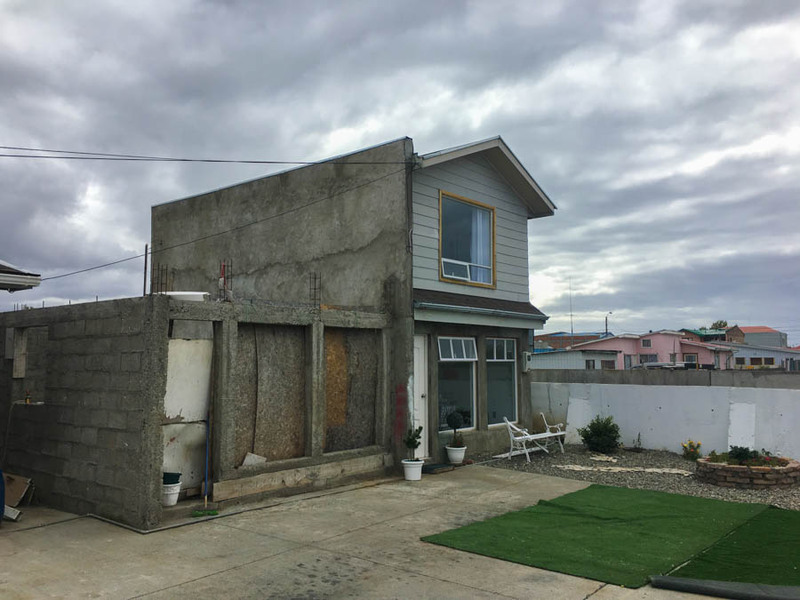 Although Punta Arenas is a major port city in the south, the drive into town from the airport made us feel like we were in a small fishing village. Looking out to our left was the wild and wavy water of the Magellan Strait, while on the right were a few small homes, some farmland and not much else. Arriving at our apartment, and certain that we had the wrong address, our taxi driver turned around to us and said “Estan seguro?”…are you sure? There we were, parked outside half of a house that looked like it was about to be condemned. There was garbage and building supplies everywhere, and it seemed as though part of the house was missing. For outdoor decor, there was a nice patch of fake grass, and a broken bench. Two somewhat grumpy people greeted us and we hesitantly made our way inside. The interior was much better than the exterior, with 2 flat screen tv’s, nice furniture and a very comfortable bed. It was actually really nicely decorated, which was strange given the state of the exterior. The only issues were the sink that poured water onto the floor every time it was turned on, the laundry machine leaked, the upstairs level looked (and felt) like it may collapse onto the bottom floor at any moment, and there were random holes in the wall that led to wires and support beams. 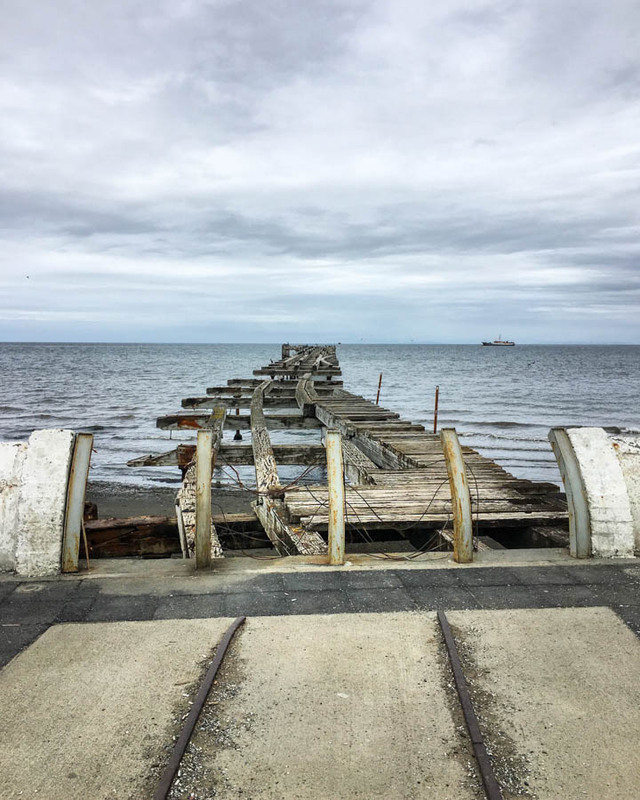 We looked at each other, dropped our bags off and headed out to see what the rest of Punta Arenas had to offer. There’s quite a contrast in Punta Arenas, caused by the sheep farming boom in the late 19th and early 20th centuries. In one area of the city you may find large elaborate homes and beautiful plazas, while in other areas, the neighbourhoods are quite run down. But, the hospitality and kindness of the locals is found everywhere. Our apartment may not have been the greatest, but the surrounding neighbourhoods were interesting. Friendly stray dogs roamed the streets (may of which joined us on our walks), locals with character-filled faces smiled at us as we passed by, and the quaint one-level homes caused us to stop and have a look. The streets were narrow, and busy with construction, foot traffic and cars. The city is one of two tax-free ports in Chile. 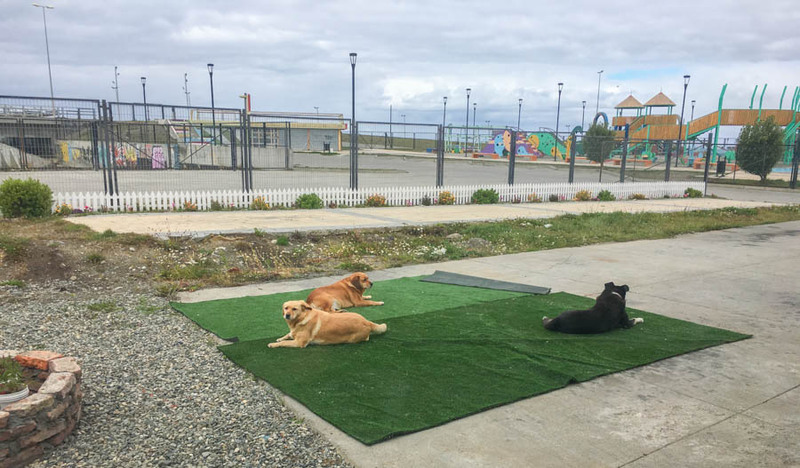 In one “zone” in Punta Arenas, goods are allowed to be imported into Chile at a reduced tax rate. As a consumer, this means you’ll find many items for sale in this zone, at low prices. Everything from electronics to cars can be bought in this complex of shops. 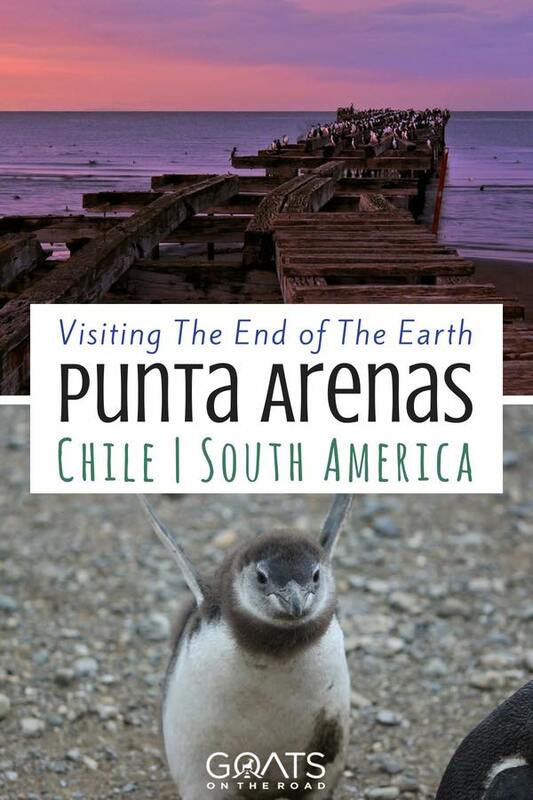 It’s funny that this would be something to see or do in Punta Arenas, but for us, it was actually a highlight. 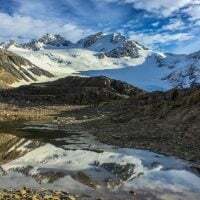 We were in the market for some camping and outdoor gear for our upcoming trek in Torres del Paine, and we found everything we needed. Being that the city is right on the ocean, going for a walk along the promenade is a recommended excursion. Directly across from our “apartment” was a sandy beach and an ocean side walkway. Littered with seaweed, driftwood, unique rocks, and actual litter, we went to check it out – with 3 of “our” dogs in tow. We walked for a couple of hours along the promenade, it seemed to go on forever. With the wind whipping in our faces, cargo ships and fishing boats in the distance, and dolphins and seabirds offshore, we truly felt like we were in the southern reaches of the world. We’re at the end of the world…and it’s cold! 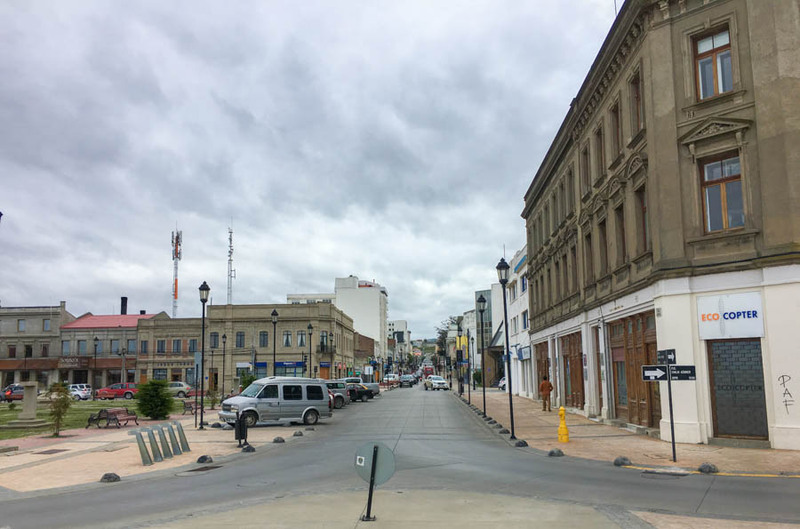 The downtown area of Punta Arenas is actually larger than we had anticipated it to be. Surrounding the main Plaza de Armas are numerous banks, grocery stores, clothing shops and restaurants. 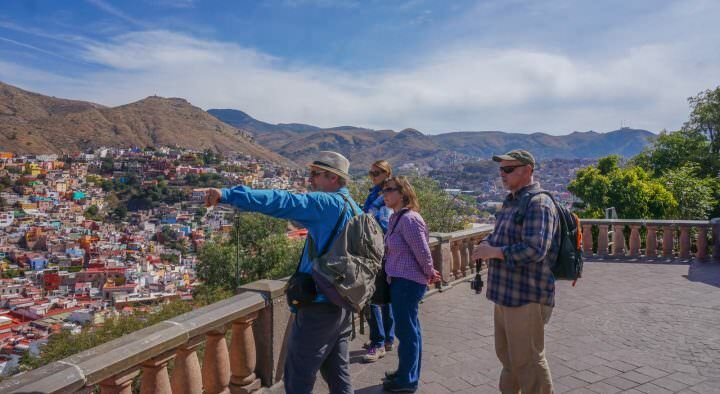 The European architecture here was a bit of a surprise to us, but given that this used to be one of the most popular ports in the world, and the fact that Europeans settled here, we should have been expecting neoclassical design. Portuguese explorer Ferdinand Magellan was the first to navigate his way from the Atlantic into the Pacific Ocean, in 1520, passing by Punta Arenas. The Strait of Magellan is named after this famous pioneer. Following Magellan were the British and the Spanish – who colonized the area. A stroll around the plaza, and people watching in the park is a great way to spend a couple of hours. Unfortunately we fell short on our hunt for the famous king crab! When we did find crab, it was cooked with other items (ie: stuffed in ravioli), but for Nick, it’s full crab legs with butter and garlic, or nothing! We did, however, find a great little restaurant called La Marmita. It was cozy, had great service and a fantastic menu with fish, meats and even some vegetarian options. But most importantly, it had tea to warm us up on the cold days. 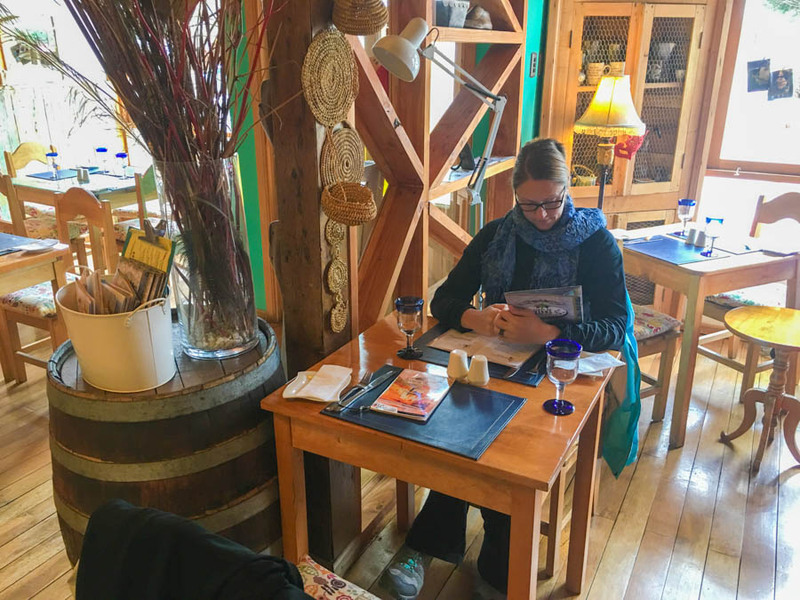 There are numerous restaurants around Punta Arenas, with the usual pricing of Patagonia – about $20 / person for a meal with drink. 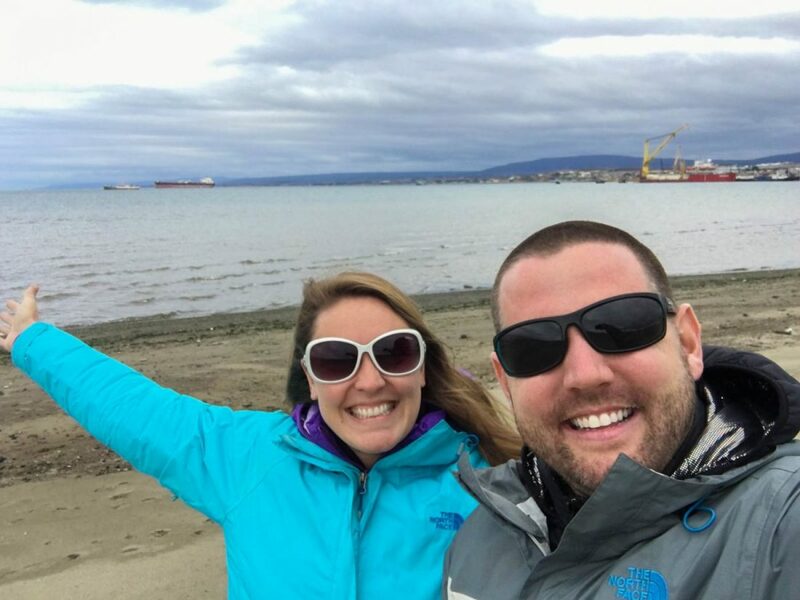 After a day to ourselves in Punta Arenas to shop until we dropped, our friends arrived from their adventures in Antarctica. We’d travelled with Jarryd and Alesha in Turkey, Bulgaria, Germany, Czech Republic, and now it was time to take on Chile. 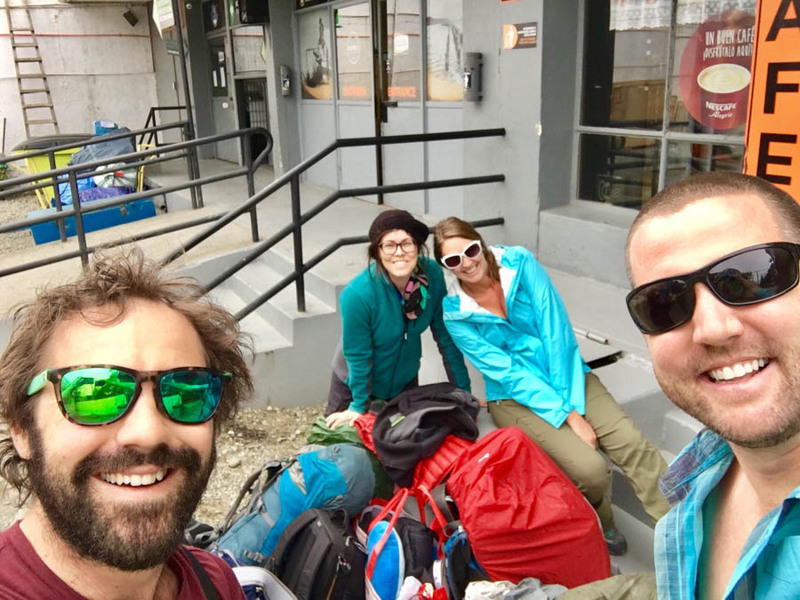 Together, the four of us took the bus to Puerto Natales, another small city in southern Patagonia, where we would embark on one of the most amazing experiences we’ve had – the “O” Circuit Trail in Torres del Paine National Park. Bring it on Torres del Paine! 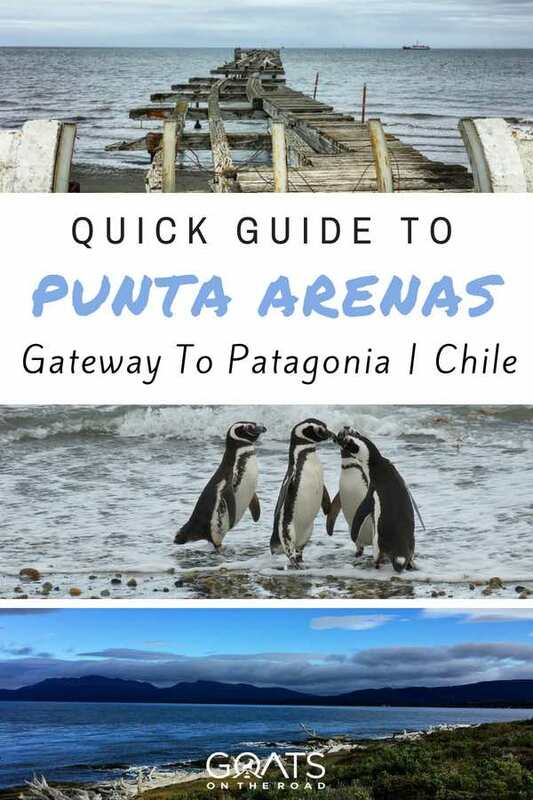 If you’re in the north or center of Chile, consider flying to Punta Arenas. 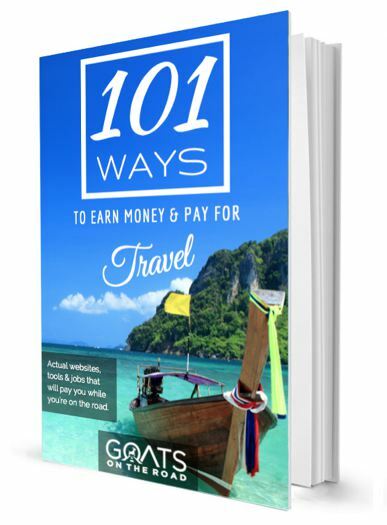 We booked our flights from Santiago to PA with Sky and the flights were $60 each. A taxi from the airport to town in Punta Arenas is 10,000 pesos ($15), and the shared shuttle is $4,000 / person. So, if you have 2 people or more, it makes sense to take a taxi rather than going on a milk run to various hotels. 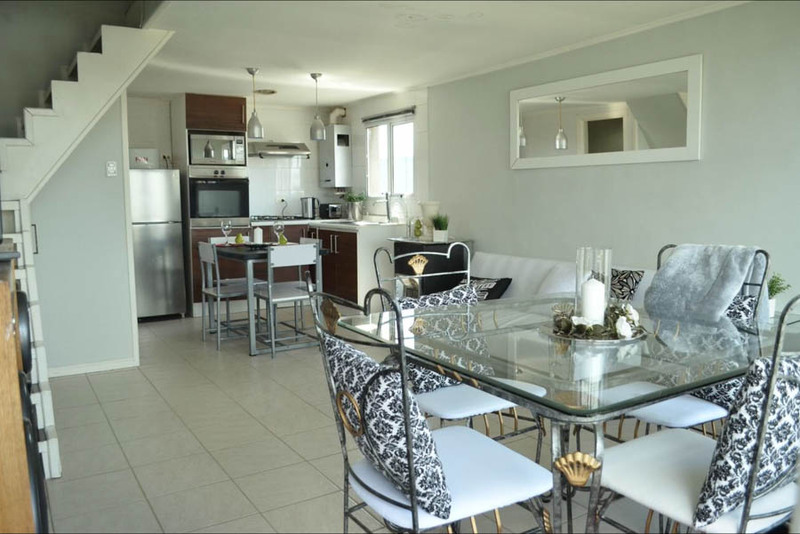 You can probably find a better place than where we stayed (Departamento Emilia House), so check for other places on Booking.com. 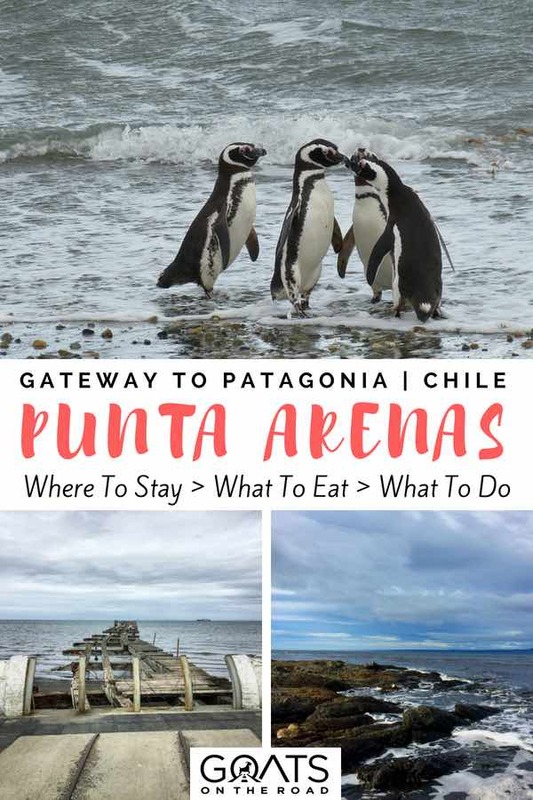 To get from Punta Arenas to Puerto Natales, book your ticket at least a day or two in advance. Our bus was full. Bus tickets are 7,000 pesos ($10.60) / person and there are around 3 departures / day. Any change that you got or will get to Port Williams? You are awesome couple.Dont put off light live.